Most garages have some form of wall organization panel or system. It may be as simple as something leaning against a wall, tucked between wood wall studs, or hung on a nail. Each method, however, is somewhat unsatisfactory as everything is stored randomly and not necessarily safely. To solve this, we recommend installing pvc slatwall with lockable storage accessories as the basics for a wall organization system. 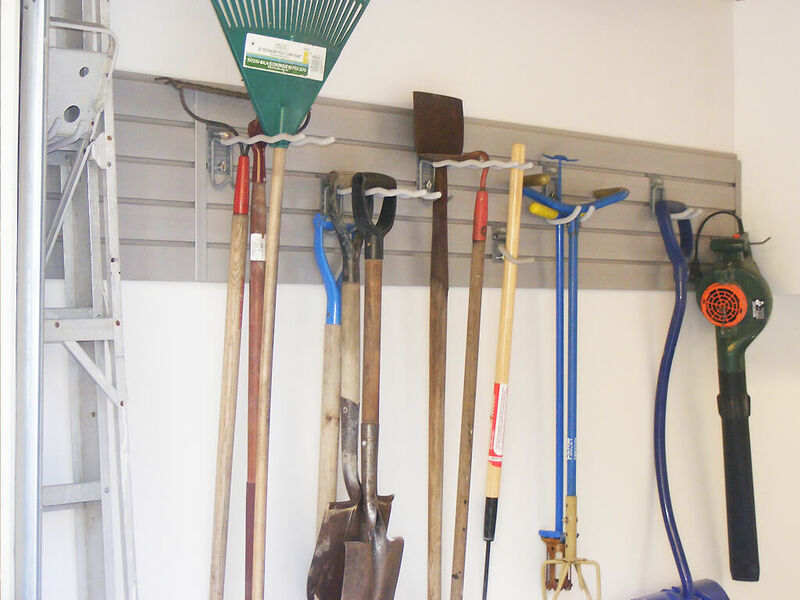 A garage wall organizer panel system offers various ways to store bicycles, sports equipment, gardening tools and other outdoor gear in the garage, making everything easier to find. With a combination of shelving, locks, baskets and other accessories, garage wall organization systems can accomodate a wide variety of family lifestyle needs. Slatwall is waterproof and resistant to mold and mildew, and engineered to meet heavy duty industry standards which makes them extremely strong. It comes in panels 1ft x 8ft large and it is available in 5 colours. The slatwall is secured to the wall by attaching it into the wall studs. Where studs are not available, building a frame using wood studs for the garage wall and then attaching the slatwall to the frame is the way to create an effective solution. The basis of our system is Handiwall™ or storWall™ Slatwall panels. We can start with a few pieces on your wall to hold hooks and baskets then add on or expand as necessary. Whether we install slatwall from floor to ceiling or as needed depends on the aesthetics as well as organizational objectives of the project. Often, a floor to ceiling installation of slatwall is applied as an aesthetic feature to make the garage feel like an extension to your home, by matching it to the look and feel of other rooms in the house. We can customize shelving to organize anything you want to store. Our PVC shelves are 8 feet long available in three depths which can be cut to any length. Because they are waterproof, they are easy to wipe clean. The shelves are supported by brackets that use the Camlok™ mechanisms for locking them into place on the slatwall panel. This assures your family’s safety while being able to support heavier storage items. Selecting the location and amount of slatwall to be used will depend on a number of factors including how you use the garage for your vehicle, the amount that you need to store and organize; as well as your aesthetic priorities vis-a-vis your budget. A strong slatwall organization system isn’t any good without the proper accessories. We use specialized hooks from storWALL™ that use a mechanism called CamLok™. The CamLok™ mechanism firmly locks to the slatwall so that when you’re lifting off a piece of equipment, the hook doesn’t come with it. This not only makes it safer but also allows you flexibilty to move your hooks without using screw as your storage needs, lifestyle or seasons change. The hooks come in many different sizes to accommodate anything and everything you would want to store. Anything with a hook or hanging loop can be hung. For larger items like leaf blowers, ladders and other heavy tools, they can be kept on cradle hooks designed to support heavy items of all kinds. 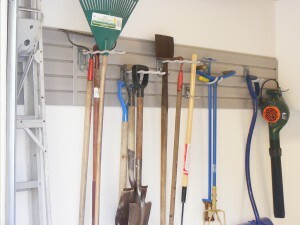 Yard tools, hand tools and sports equipment fit on one of two sizes of Universal Hooks. Specialty hooks for bike storage will hold any size bicycle or tricycle. For tools with long handles, the Heavy Duty Tool Hook will store multiple long handled tools in a single location. Baskets are recommended for storing items such as balls, fertilizers, bottles, and car cleaning supplies. The design allows you to see what’s in the basket and provides a place where everything can be easily found. There are 2 sizes. Each basket size is 24in. wide x 9in deep, but one is 5in. high and the other is 9in. high. Baskets offer a handy garage storage solution for sports enthusiasts, gardeners and car enthusiasts alike. Make maintenance easily with wipe-clean surfaces. 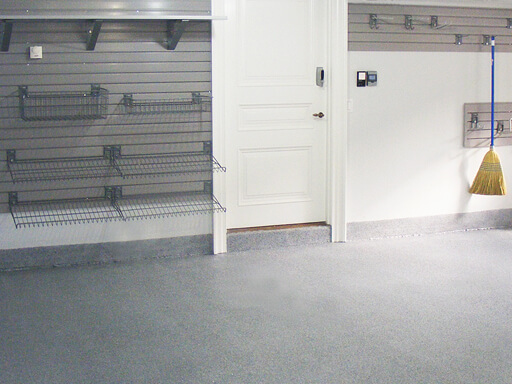 Slatwall is one of our product of choice and serves as the foundation for garage organization. The patented product panels accept accessories from storeWALL™ and a variety from other manufacturers. This allows you to easily add more storage when you need it. The wall panels are extruded of industrial grade thermoplastic in panels 15’’ high x 8’ long. A patented tongue and groove allows for seamless installation. Although there is other slatwall on the market, NONE compare to the strength, durability, and versatility of storeWALL™. storeWALL™ is available in three SOLID CORE designer colors and two beautiful SOLID CORE wood grains. You’ll never paint again. The panels are dint and stain resistant and wipe clean in seconds. 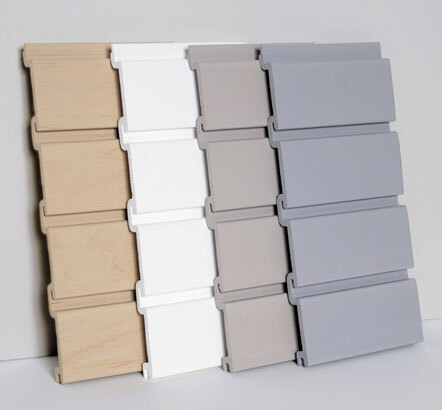 Unlike conventional particle board and MDF slatwall, storeWALL™ is molded of a thermoplastic. In addition to being rugged, it is waterproof and mildew proof. The panels are designed to withstand tough abuse. storeWALL™ designed to last a lifetime, and the warranty is designed to give you peace of mind. storeWALL™ Heavy Duty™ Trim is durable enough to absorb years of impact without shattering, and versatile enough to tackle the toughest detail challenges. It’s available in three profiles in each panel colour to help provide the perfect finishing touch. Each trim profile (Flat (#3), Small L (#4), Large L (#2)) includes SpeedBond™ acrylic peel and stick adhesive(#1) for a fast and lasting bond. Specially designed screws, colour matched to each panel colour, are used to install storeWALL™ panels to wood or metal studs, concrete block or poured concrete walls.